Well, its the beginning of another week and with only ONE WEEK left in Sale-a-bration I thought I would highlight a couple of the stamp sets. I love this Lotus Blossom stamp, free with $60 purchase! Each blossom is built up of three photopolymer stamps, and to make it really easy for lining up (no Stamp-a-ma-jg required!!) there is arrows on each stamp to help you quickly and easily ink away! The card I'm sharing today uses only ONE ink color to create the flowers (which I'll talk more about in a bit) and features a simple technique that helps add dimension to any card front called Spotlight Die Cutting. To create the Lotus Blossoms using only one color ink, in this case Smoky Slate keep the rule in mind of working darkest to lightest. With the stamp marked #1 stamp the image with Smoky Slate ink, being mindful of where the directional arrow is pointing. Apply ink to the stamp marked #2 then stamp off the image ONCE onto a scrap piece of paper. Stamp the image a second time over top of the first image, lining up the arrow in the same direction as the first image was stamped. Apply ink to the stamp marked #3 then stamp of the image TWICE onto a scrap piece of paper. Stamp the image over top of the first two images, lining up the arrow in the same direction as the previous two images. You should now have a perfectly shaded, three toned flower! How simple and pretty is that?? To create the Spotlight Die Cut image, first cut a piece of Whisper White card stock to the size you would like to fit on the card front. Lay a Framelit (the tags from Chalk Talk are a good choice!) into position onto the Whisper White card stock and run through the Big Shot. Apply a removable adhesive to both negative and positive pieces of card stock and assemble back together onto a piece of scrap paper. Stamp images so that they fall both on and off the die cut piece. Remove the pieces from one another. At this point you can step up your project by re-stamping the images on the die cut portion with Versamark and cover with embossing powder. This will really "spotlight" your images. Back the larger piece of card stock with a contrasting mat color. Apply two thicknesses of Stampin' Dimensionals and place back into opening creating your Spotlight Die Cut. That's all from me today! If you haven't already make sure you head over to Craft Project Central and leave a comment on my Campout Gift Box & Pop up Card project for your chance to win a FREE subscription to all of March's tutorials! I'll be making the draw on Wednesday so don't miss out!! This is really cute. We have a spotlighting challenge at The Paper Plunge and would love to have you add this one to our challenge. Beautiful card, Melissa! 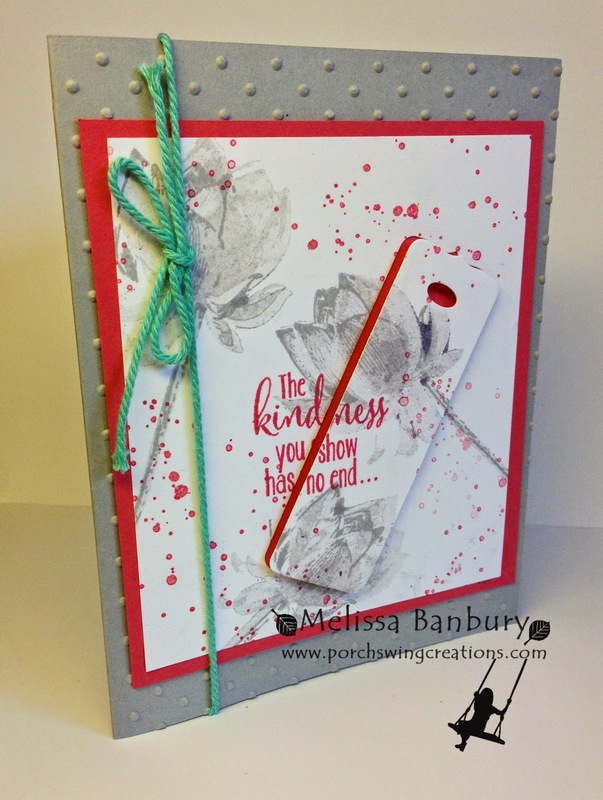 Loving the 'popped' die cut tag...it adds such dimension! Thanks for playing with us at The Paper Plunge!